Mt. 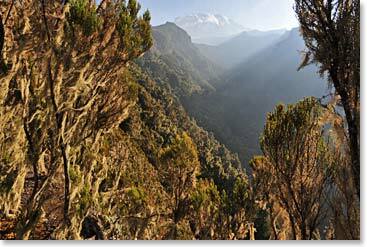 Kilimanjaro, the highest point in Africa at 19,340 feet, and one of the Seven Summits, is the highest freestanding mountain in the world. Join Chet, Colleen, Landon and Autumn Sutterlin along with Wally Berg and our Berg Adventures team as they attempt to summit this great mountain by the Umbwe route. This Berg Adventures alternative to some of the more overcrowded Kilimanjaro routes traverses the most beautiful sections of Kibo’s southern flanks. We will reach the summit at Uhuru Peak via Stella Point. Follow our daily dispatches as our team walks through the most pristine and untraveled section of the cloud forest, the Umbwe Trail that includes an overnight at the beautiful heights of Barranco, beneath Kilimanjaro’s spectacular Breach Wall. Following their climb to the rooftop of Africa the Sutterlin family will continue their adventure onto a safari where they will have the chance to explore Tarangire and Serengeti National Parks where Africa’s diverse wildlife is sure to be enjoyed.